Monster ADZ Media can help you with an Advertising Campaign. Our advertising services will help you establish your brand in the marketplace through the use of Mobile LED Billboard. We offer the lowest cost, high impact advertising in the market. 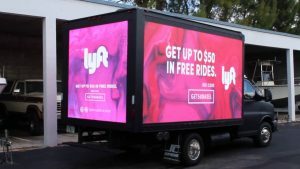 The significant advantage of mobile billboards in Dallas and other major cities is that they receive unsurpassed attention, as moving objects are irresistible to the human eye. Mobile billboards can bring your advertising message into hard-to-hit locations, and your route is targeted to deliver immediate, overwhelming results. Reach people during their drive to and from work, or reach the growing number of pedestrians who choose sidewalks over highways. Mobile billboards also let you deliver your message in areas where traditional billboards are unavailable or not allowed. Mobile LED Billboards is the most cost effective advertising compared to other medias. The chart shows you the typical cost per CPM (per thousand impressions). Mobile Billboards is seen by 1000s daily. Locally based Mobile LED Billboard Company serving the Plano, TX and surrounding DFW area. We are capable of delivering high impact marketing campaigns of all sorts!